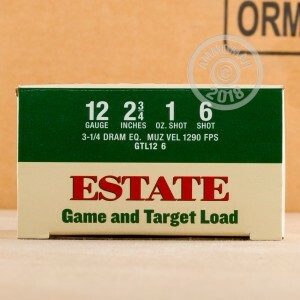 This 12 gauge ammunition from Estate is equally at home on an upland bird hunt or a clay shooting session. 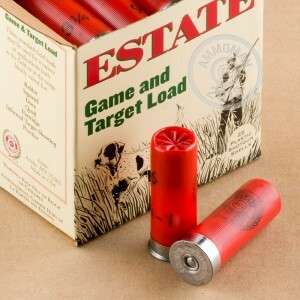 Each 2-3/4" shell in this case of 250 fires an ounce of #6 birdshot at a muzzle velocity of 1,290 feet per second. These shells produce moderate recoil and good accuracy at medium range. 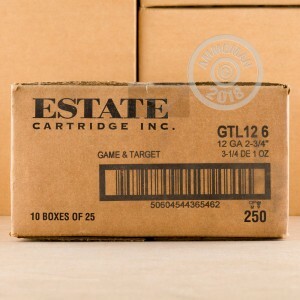 Estate shotshells are loaded in Anoka, Minnesota by Federal; both brands are part of the Vista Outdoor group. Grab this case or any other items totaling $99 or more to get free shipping from AmmoMan.com. It's an easy way to save, particularly if you do a lot of shooting.